When you get married, you agree to take your spouse “for richer or poorer,” as well as in sickness and in health. 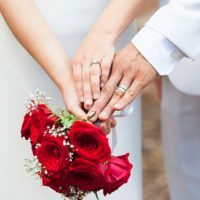 Unfortunately, some newlyweds are in for a nasty surprise when they discover that their newly-minted spouse has terrible credit—and possibly far worse. To avoid any unpleasant discoveries, you should have an honest financial discussion before heading down the aisle. Although you might dread it, knowing the financial health of your relationship can be vital for avoiding a quick trip to divorce court. Unless you both are debt free, a portion of your income will need to go to debt service every month. Before saying “I do,” you really need to know how much debt service will be. As part of a financial heart-to-heart, you should talk about your debts. Of course, you might be embarrassed that you are carrying $12,000 on credit cards without much to show for it. But your spouse needs to know this. High debt loads often means a delay on buying a home as well as an increased chance one of you will file for bankruptcy. Sit down and write out all your debts, as well as how much you pay each month. Also estimate the projected payoff date. Ask your fiancé to do the same. Once married, you will probably begin filing taxes jointly. This means that the IRS can seize any refund if your spouse has unpaid tax debt. You should know this upfront so you aren’t surprised when your anticipated refund never comes through. Many people balk at sharing their credit score. What’s in a number, right? Actually, your credit score will determine whether you can get a loan and the interest rate. It can also impact whether you can rent an apartment or get a job. Depending on each spouse’s score, you might need to delay significant purchases, like a home. A few missteps years ago can continue to reverberate for years, keeping your score low. But what is key is that you and your fiancé develop a game plan for maximizing each person’s credit score. Remember that regular, on-time payments for at least the monthly minimum are essential. Also try to contribute as much discretionary income as you can to reduce the principal so you pay down the debts quickly. You should realize that a bankruptcy is not the end of the world, and people can bounce back quickly if they are vigilant about using credit correctly. Sometimes, wiping out debts in one fell swoop makes more sense than paying thousands of dollars in interest payments for years as you slowly chip away at debt. Married couples can file bankruptcy as a couple or as an individual, and there are many considerations before you decide which is best. At Nowack & Olson in Plantation, we help indebted consumers take a clear-eyed view of their financial situation and identify the best strategy for tackling debt. For a free consultation, please call us at 888-813-4737 or submit an online message.